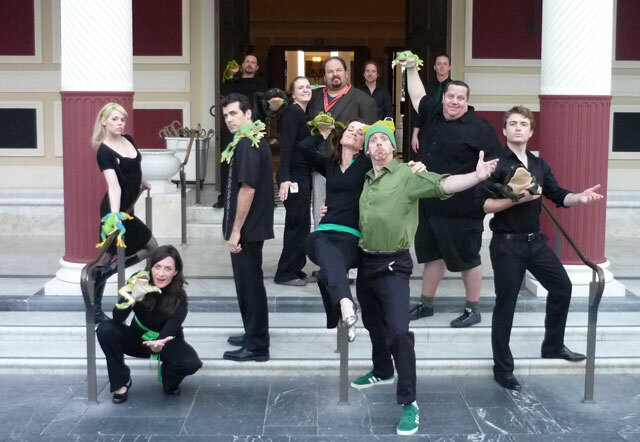 The Troubadors posing in front of the Getty Villa with their fellow frog actors. A 2,400-year-old comedy. One week to work on it. Oh yeah—and it’s a musical. The Getty Villa is a hotbed of new ideas about very old theater. In the new Villa Play-Reading Series, translations and adaptations of classical plays are workshopped by theater companies in one week and then read to an audience in a weekend of free performances at the Villa. There are no costumes, very few props, and most of the actors have to play at least two characters. In the recent rendition of Aristophanes’ The Frogs, Herakles was played by a woman. The results are unpredictable, but this is part of the point—to try out a play on a live audience and troubleshoot problems. With luck, these plays will get refined at the Villa and move on to full productions elsewhere. Norman Frisch, manager of the Villa Theater Program, says the world of classical theater is a tough one because good translations are hard to come by. Many translations are British, so they don’t work well in North American accents and fall flat with audiences here. For The Frogs he sought out a comedy troupe from Burbank, the Troubadors—aka “The Troubies”—to read a version of the play rewritten as a Bush-era critique on war and culture by New York playwright David Greenspan. The Troubies have experience transforming ancient comedy for contemporary audiences. Their version of Oedipus set to Elvis’ music, Oedipus The King, Mama!, was a comedic hit last year at the Villa and was just performed again this past Saturday, April 10, in Long Beach. The Troubies’ reading of The Frogs in March was a fresh mash-up of the contemporary and the ancient. The story follows Dionysos, the god of theater, as he travels to the underworld with his sidekick Xanthius—a sort of travelogue of the sights and characters of Hell. A live organ accompanied the performance, the frogs were a chorus of hand puppets, stage directions were read aloud, and a Powerpoint slideshow illustrated the reading with ancient imagery of the gods and heroes, as well as maps of the ancient world and 20th-century images evoked by Greenspan’s script. The result was fun, witty, and cacophanous. You may be wondering, “Why did Dionysos go to the underworld in the first place?” Hmmmm. When asked in the play, Dionysos replies: “I’m in the arts. It’s a business trip.” In this story, the journey was definitely all of the fun. Up next: The Villa Theater Lab series also explores reinterpretations of classical theater. Check out Piedra de Sol (Sunstone), inspired by Octavio Paz, coming up May 14–16. I am a writer and editor for the Web Group at the J. Paul Getty Trust. 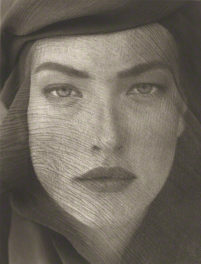 In a previous life I studied American art and the history of photography; in this life I am studying for a master's in library and information science. In my free time (what little I have), I like to travel to places like Kyrgyzstan and Ethiopia, take pictures, sew, make ice cream, and study Chinese.